In the cool living room of a stone-built house in Northern Israel I might just have held in my hands the keys to the ancient mysteries of Christianity. And then again, I might not have. With the blinds shuttered against the glare of the midday sun my host, Hassan Saeda, lays out a collection of extraordinary books which he says are about 2,000 years old. Flowing of hair and neat of beard, he bears a distracting resemblance to an illustration of Christ from an old children's Bible. It lends the scene an air of extra gravity. 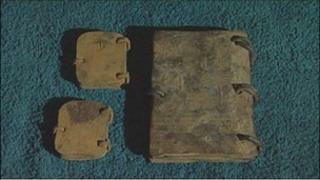 The books - bindings, pages, covers and all - are made entirely of various metals. They are inscribed - or engraved, stamped or embossed - with various simple pictures and writing in a variety of languages including Greek and Old Hebrew. And they are astonishingly heavy. Some are no larger than a credit card but some are the size of large-format modern paperbacks. The largest that I handled probably weighed 4 or 5kg (about 10lbs). You can see why the publishing industry was eventually won over by the flexibility and portability of paper. But that is where the supply of undisputable concrete fact about the collection - which some people refer to as the "Lead Codices" - more or less runs out. Mr Saeda, for example, says the books have been in his family for 120 years, after his grandfather discovered them in a cave. Other people who have met him to discuss the books say he found or bought them in Jordan within the last five years and smuggled them into Israel. Mr Saeda is sticking to the current version of his story in which he acknowledges that many experts who have seen the metal volumes consider them to be fakes. "I spent so much time and so much money to prove these are real. There are a lot of professors and one of them told me that I'm living in a fantasy. My answer to him was: 'I think you got old and your eyes don't see anything.' I took my book and went away. Many professors say it's a fake. Why? I don't know why. But this is a real book." Mysticism and magic swirl in the dark air as Mr Saeda enlarges on the possibilities he sees in the codices. They might contain the real story of the destruction of the Jewish Second Temple by the Romans, he says. Or they could fill the gaps in our knowledge of the early Christian movement. They might even hold the key to universal happiness. If they are real, that is. The Holy Land is one of the homes of archaeology. Indeed for years, one of the main purposes of the science was to search for tangible evidence that would prove the truth of the stories of the Bible. And there has always been money in it too. There are enough pieces of the "True Cross" in circulation to make a wooden aircraft carrier. And enough nails to put it together. British taxpayers will wince at the thought that a king of England once paid 100,000 gold coins for the "real" crown of thorns from the New Testament. There are stories of not one but several foreskins of Jesus which have been recovered, sold and venerated and of the feathers of the wings of the Archangel Michael being preserved in Pennsylvania. For every seller, it seems there is a buyer. So I went to see Lenny Wolfe, an antiquarian who lives and trades in Jerusalem and who painted a gripping picture of a Middle East antiques market where the unwary and the inexpert tread at their peril. Factories in Syria knock out fake antiquities to order and every month brings new stories of caves in the remote valleys of Jordan where golden treasures are hidden that will change the way we see the world. Mr Wolfe has seen the lead codices and decided not to invest. He is a philosopher as well as a trader, interested in the foibles which inspire people to seek out antiquities which may well be fake and to pin their hopes on them. Or, as he put it: "The greater, the more sensational the story, the more the chances of it being real are miniscule. I'm very interested in the behavioural or anthropological aspects of the antiquities trade." Mr Wolfe is writing a book, entitled Forgeries and Controversies in Biblical Archaeology. "There are enough controversies and forgeries to make this a lengthy tome," he says. Joe Zias, an anthropologist who served for 25 years as a senior curator at the Israel Antiquities Authority, is equally sceptical. The golden rule in archaeology, he says, is simple - when you hear extraordinary claims, ask for extraordinary proof. Mr Zias says the world of archaeology has changed since Hollywood gave us first Indiana Jones and then the Da Vinci code. No longer is the archaeologist a nerdy toff with a shovel and a Shorter Oxford Dictionary of Latin. Suddenly he or she, is a swashbuckling figure solving the sinister mysteries of antiquity. They are still searching for the Holy Grail of course - except that now the Holy Grail is not just the find itself but a story of danger and adventure in the process of searching that secures you a deal for a book or a documentary. Joe Zias says the odds are always against any such finding turning out to change the way we look at ancient history as the Dead Sea Scrolls once did. He says he has seen many people bringing artefacts to his museum during his quarter-century as a curator, but the only genuine one was a fragment of Byzantine pottery found by a tourist on Mount Sinai. "It wasn't going back to the time of Moses, but in 25 years that's the only thing I ever saw that was authentic," he says. Now there are those who believe - just as Mr Saeda does - that the Lead Codices are genuine and that they hold important secrets about the ancient world. But the search for truth in the Holy Land has been littered with fakes and forgeries for hundreds of years and when great claims are made for a new discovery, the burden of proof lies with the finders. And the burden is a heavy one.